), mobilizing national institutions, inter-governmental organizations, space agencies and the research community, has worked to facilitate access to satellite, airborne, and in situ data, and create a framework to establish technical standards for a global network of national forest carbon tracking systems. GEO, with the help of the Google Earth Outreach team, has worked to develop a forest carbon tracking portal which will become a central point for online collaboration and data collection. Today, the first version of the portal was launched at a GEO plenary. The portal itself runs on Google Apps. I worked with GEO to create a web page that uses the Google Earth browser plugin and Appengine. 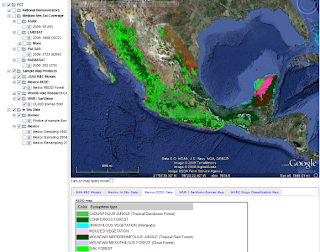 The page shows satellite data provided by several space agencies, as well as the first maps that can be used to detect deforestation. It is structured to also show other types of data and maps as soon they become available. 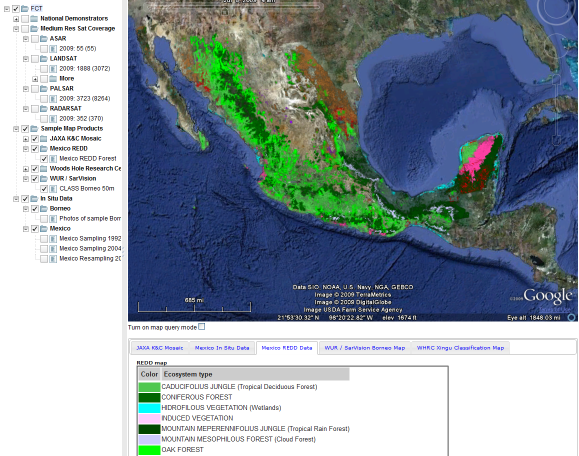 Here's the map of Mexico forest types within the portal interface. You can zoom in to see individual polygons and click on them to see the corresponding forest type. You can read a more complete description of GEO FCT (Forest Carbon Task) here. I'd like to thank numerous GEO FCT participants for their feedback, as well as other Googlers who've provided technical help. In particular, kudos to Roman Nurik for his original KML layer example, as well as to Matt Hancher and Rupert Breheny. Did you know that deforestation and forest degradation account for almost 20% of global warming emissions? That is more than all of the emissions from global transportation combined! Yet, it has historically been difficult to integrate avoided deforestation and degradation into climate policy plans. Why? In part, because it requires a great deal of collaboration and technical expertise to make sure that the right data are collected and made accessible and that the right techniques are available to analyze and verify the data. Scientists, NGOs and politicians have been working on this problem for a while, but only recently has a truly comprehensive international approach been attempted. The Intergovernmental Group on Earth Observations (GEO), mobilizing national institutions, inter-governmental organizations, space agencies and the research community, has worked to facilitate access to satellite, airborne, and in situ data, and create a framework to establish technical standards for a global network of national forest carbon tracking systems. GEO, with the help of the Google Earth Outreach team, has worked to develop a forest carbon tracking portal which will become a central point for online collaboration and data collection.